Background: Over the past two decades, there has been a decrease in dental diseases in Australia; however, the number of preventable dental hospital admissions has not diminished. This review reports on the factors associated with preventable dental hospital admissions in Australia. Methods: A search of five databases was conducted using Medical subject headings/Emtree terms and Index terms. All original studies, published between January 1965 and March 2018 in English, based on the Australian population, and examining the prevalence of oral conditions as a cause for emergency department presentations and hospital admissions were included. The mixed method appraisal tool was used to evaluate the included studies. Results: Eleven cross-sectional studies met inclusion and exclusion criteria. All the studies, except one from Tasmania, were from Western Australia. The most common reasons for preventable dental hospital admissions were dental caries, followed by embedded or impacted teeth. Malignant neoplasms were reported as main causes of preventable dental hospital admissions in the older population. 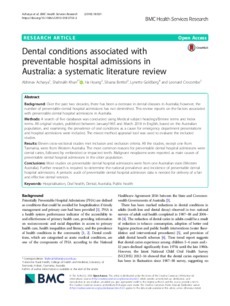 Conclusions: Most studies on preventable dental hospital admissions were from one Australian state (Western Australia). Further research is required to determine the national prevalence and incidence of preventable dental hospital admissions. A periodic audit of preventable dental hospital admission data is needed for delivery of a fair and effective dental services.